Sciblogs | So what is an API and why does it matter that Trade Me just released one? So what is an API and why does it matter that Trade Me just released one? This afternoon Trade Me announced the release of their developer application programming interface (API). This is really cool news … but why? An API is a set of programming instructions and standards that enable different software applications to interact. Hmmm …. that’s the sort of description that probably only makes sense to people who already know what an API is. Perhaps it’s easier to look at a couple of examples. In recent years many organisations have released interfaces for other software developers to use to build cool new things. One reason you see Google maps all over the web is because Google have a rich, well-documented, easy to use family of mapping interfaces available for people to make custom maps with. Using Google’s APIs, developers can embed interactive maps into their websites and access many geographic services, such as driving directions and adress geocoding. Closer to home, DigitalNZ is an initiative led by the National Library of New Zealand to help people find, share and use digital content from government departments, publicly funded organisations, the private sector, and community groups. Something that is really neat about the DigitalNZ API is that you don’t need to be a programmer to use it. For example, you can create your own custom search engine and embed it in your own website. Give it a try – it’s fun! I am excited about the release of a Trade Me API for two reasons. First, creative people will make new web and mobile applications that work with Trade Me’s data and services to do useful and clever things. Second, there is an opportunity for people interested in data visualisation. Trade Me has become an important aspect of our collective consumption habits. The API opens a door to this data and I hope we will see inventive mash-ups and visualisations over the coming days and weeks. P.S. 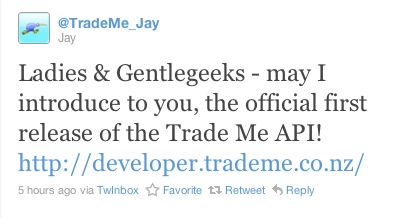 If you do start playing with the Trade Me API, be sure to follow the terms and conditions. How do you retrieve the current member ID or Name?